60 minute class in the Pranakriya style. If you have ever said "I can never do yoga because I'm not flexible", then this is the class for you. Yoga for Stiff People is geared towards people who feel limited by stiffness and general achiness, and lack of flexibility. Yoga is universal! If you can breathe and have working muscles then you can do yoga, so we will spend time finding your yoga poses to bring the practice to your body. We will be using blocks, blankets, bolsters, and whatever else we can get our hands on to make the experience fun, challenging and mindful. The class will begin with finding a relaxed seat, followed by some movements and poses based on the area of focus that week. 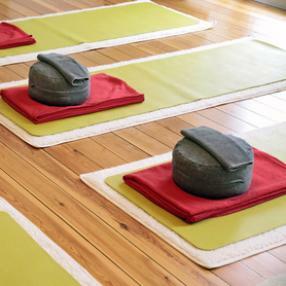 We will end with some restorative poses and lying down on our mats.